Have you ever thought about reading the entire Bible? It's difficult to do if you attempt it in one sitting, but easy to do if you spread it out over a year. 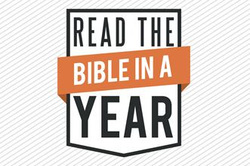 The 1,189 chapters of the Bible can be read in a year at a rate of 3¼ chapters per day. This Bible study plan uses the English King James Version made available at the Bible Gateway. The organization of this Plan. There are 929 chapters from the Old Testament and 260 chapters from the New Testament, so please expect to read more from the Old Testament than the New. The first month is devoted to Genesis and Exodus. The last month is largely devoted to the prophetic books of Daniel and Revelation. You will read from the Psalms every tenth day. The New Testament starts in the second month, and generally there will be one NT chapter per day. Read the KJV Bible in a year, reading three chapters daily and five on Sundays. Start on today's date and finish the Bible a year from today! Skips New Year's Day, Thanksgiving, & Christmas.